In the previous blog, we talked about the Learning Cycle. At the individual level, employees can assess their competencies against those required for their own job, or for another job in which they are interested, and then take steps to acquire or improve any necessary competencies. If they do this in conjunction with their supervisors, more formalized individual learning plans can be created based on the employee’s strengths and areas for development. The plans can be implemented and progress tracked, reviewed and evaluated, and so the cycle continues. Let’s now look at this individual learning cycle in more depth. 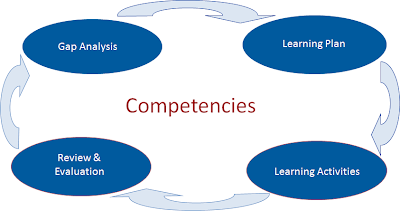 Self-Assessment: Typically, the behavioral indicators for the competencies and proficiency levels needed within the target role / job are used as the standard for assessing the performance of the employee using a common rating scale for assessing each competency and / indicator. The results are compiled and a report is provided that includes the results for all competencies, highlighting both employee strengths as well as competencies requiring improvement. 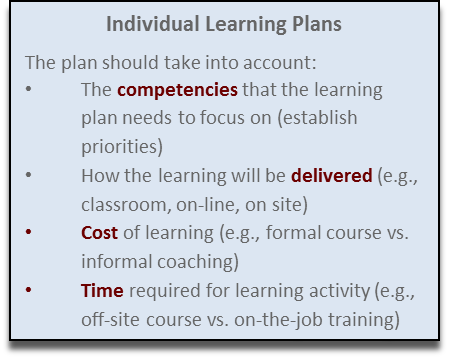 This information can then be used to support the development of an individual learning plan (see below). Multi-source / 360: Multi-source or 360 feedback is similar to the self-assessment process except there is more than one evaluator. The process includes at a minimum the employee and their supervisor, and can include others with whom the employee interacts within the workplace (e.g., peers, team members, clients both within and outside the organization, reporting employees; etc.). Once again, a report is prepared on the feedback results to allow the employee, supervisor and / or others (e.g., coach / mentor; learning advisor; etc.) to target learning and development efforts to the particular employee’s needs. 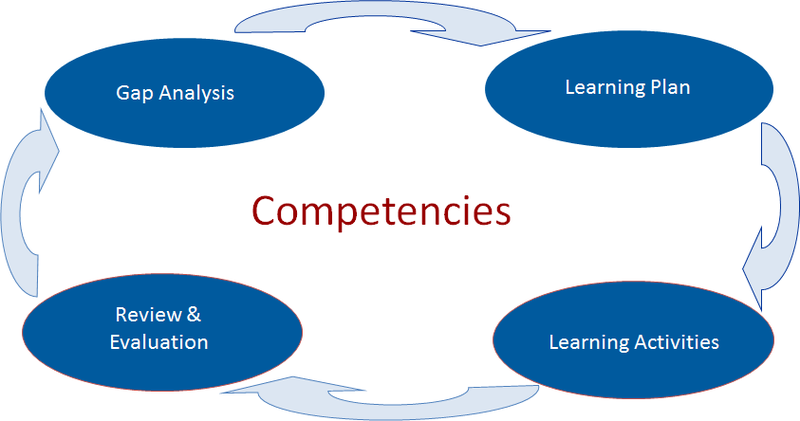 Assessment through other Methods: Competency assessments can be accomplished through a wide variety of other methods, including those typically used in a selection process (see Recruitment & Selection section), such as: competency-based behavioral interviews; in-baskets; role-plays and simulations; track record / portfolio reviews; etc. As well, formalized assessment is often included as a component of employee development programs for the purpose of assessing the employee’s base skills / competencies going into the program, progress in development at any point, as well as level of success at the end of the program. Once employee strengths and areas for development have been defined, it becomes possible to develop individual learning plans targeted to particular learning needs. At a minimum, tools to support this process include a set of instructions or guide for completing a learning plan as well as a standard learning plan form. With the support and coaching of the employee’s superior, the employee implements the plan and review occurs periodically throughout the cycle. If new learning requirements are identified (e.g., new equipment, new methods, new project, etc. ), changes / additions are incorporated in the plan. Throughout and at the end of the cycle, review and evaluation occurs to determine the extent to which learning has occurred and what should be carried over into the next cycle. Competency-based assessments can occur to support this, as noted above. The next blog in this series examines the learning cycle at the organizational level. Sign up to our blog’s mailing list through the form on the right-hand side to receive the rest of the series in your inbox.